Very bitter sweet day today. Finished out a major inspection for our company to gain our EHNAC accreditation … and it is also my last day with Alpha II (aka Unicor Medical). I will definitely miss those who I’ve come to respect and cherish as friends here. On the other hand … I am really excited and looking forward to the challenges ahead of me as I start my new job with the Cerner Corporation (working at Baptist South Hospital) this coming Monday!! God is so good … and I’m grateful for His faithfulness as I transition from one job to another!! 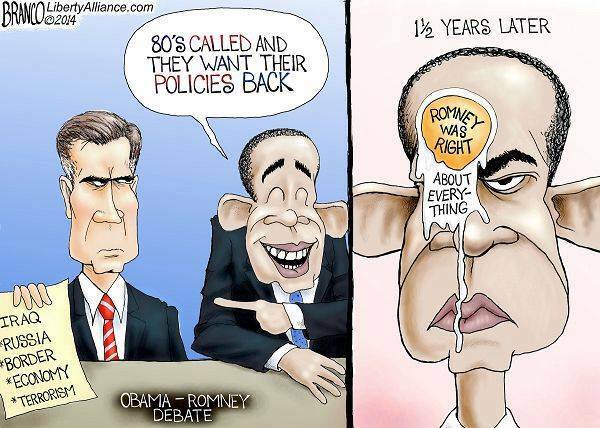 Remember the second presidential debate in 2012 when Mitt Romney was laughed at over his suggestion that our country was not prepared to handle the challenges ahead? Would you like to know WHY he was laughed at? It’s simple: Low-informed voters led by a low-experienced president.